One of the things covered in level one is wet finishing. This most important transformation is not generally well appreciated amongst some Weavers. Many people advise to just ‘wash’ it, which at least (imho) is better than doing nothing at all, but also is just the bare minimum of effecting that change from woven web to ‘real’ cloth. One of the students is a conservator by training and has always been very reluctant to do anything more than scour her woven goods. Today I convinced to to remove her conservation hat and take a leap of faith. The magic in the Water happened and she is now a believer. This is why I take the red eye across the country! The classroom is ready. The studio is ready. Well, a few more things, but as ready as I can be. I’m expecting students to begin arriving at any time now. We will go out for dinner at a nearby restaurant along with some of the level two students. Even though flying across the country isn’t nearly as much fun as I’d like, the students never fail to inspire. Their desire to learn more is the fuel that keeps me going. Level one has seven students so we should have plenty of time for All The Questions. Level two has 10, but most are very experienced, several of whom have been teaching for years. Their willingness to contribute resources, samples and their knowledge makes it a delight, too. And, while it is chilly, it isn’t raining...or snowing...so it’s all good. I did manage to doze for a bit on the plane but according to my body it’s actually 4 am and I ought to be sleeping. In my bed. Oh well, I can fall into bed early tonight. I’m hoping to get over the jet lag quickly so that I’m functioning by Monday. I’m assured the snow is gone. I should hope so! Currently reading the latest Flavia de Luce book, which is packed away and I can’t recall the title. One small corner in the studio. Squirrel cage swift for coning off skeins. Leclerc Fanny loom in background with 2/3s of a warp to be re-sleyed and woven off. Soon. As in as soon as my teaching schedule allows. Foreground - a heap of various projects - place mat warps for craft fair season (four more bins of table runners hiding in another corner), book projects, info for warp on Fanny, student homework peeking in from the left hand side. The entire studio is this kind of mess. The AVL has not been touched in literally weeks. Months. Doug got a warp beamed and I just haven't had the time to thread it. I'm hoping it won't sulk too much after being ignored for so long. From now until, well, about 15 months from now, I am going to be in a mad scramble. As usual. Recently I saw an old Facebook post - a cartoon me in front of a door waiting for opportunity to knock. My problem is not that I wait for it to knock, I can't say no when it does. So year after year, I have - in an attempt to earn enough to keep the wolf at the door at bay - accepted pretty much any and every offer that ever came my way. I have woven and sold my textiles at every show I thought might be suitable - at least once, to see if it really was suitable. I've sold my work on consignment, with all the administrivia that entails. I've written articles on spec and hoped the effort I put into them would be acceptable. In the early days I did them for free, just to get my name 'out there'. I've ghost woven for other weavers. I've woven miles (literally) of black fabric for a fashion designer, developed her ideas into something that would work in woven cloth (she was a colourist, not a weaver as such). I've developed workshops, acted as my own 'agent' booking teaching tours - again with all the administrivia that entails in terms of booking flights, financing them, arranging with locals for on ground transportation, appropriate equipment, sending out the class handouts and yarns for the warps. Packing it all up and schlepping the boxes to the post office. Having gained sufficient confidence in technical writing and seeing a crying need for information on wet finishing for hand weavers, I wrote, self published, financed an incredibly expensive publication, marketed it - and again with schlepping the boxes (literally hundreds of them) to the post office. My dining room turned into a shipping office. Recently an idea I pitched to a magazine was turned down. Now, my usual reaction would have been to immediately turn around and offer a different project. Instead I took a deep breath, thanked her for her consideration, and perhaps another time. And walked away thinking that I had just dodged a bullet with a deadline of mid-August to submit the woven item and write up. I realized that I really do not have to scramble any more. I'm turning 68 in a little over a month. Many people I know of my age - and younger! - are already retired, enjoying their leisure time, not scrambling to earn a buck or two. I am getting the state pensions I qualify for - I have a level of financial security I have never had for my entire adult life - or at least since choosing weaving for a career. So I am looking hard at my calendar. Blocking out the time necessary to do what I have committed to for the coming 15 months and looking beyond that to a time where I can choose to toss out some hats. Read the heap of books on the hearth. Make some jigsaw puzzles. Spin. Make lace. I think this is what 'they' mean by 'retirement'. Because I won't stop weaving. But I can stop the mad scramble. The warp currently on the loom is for gamps. Colour and value gamps. 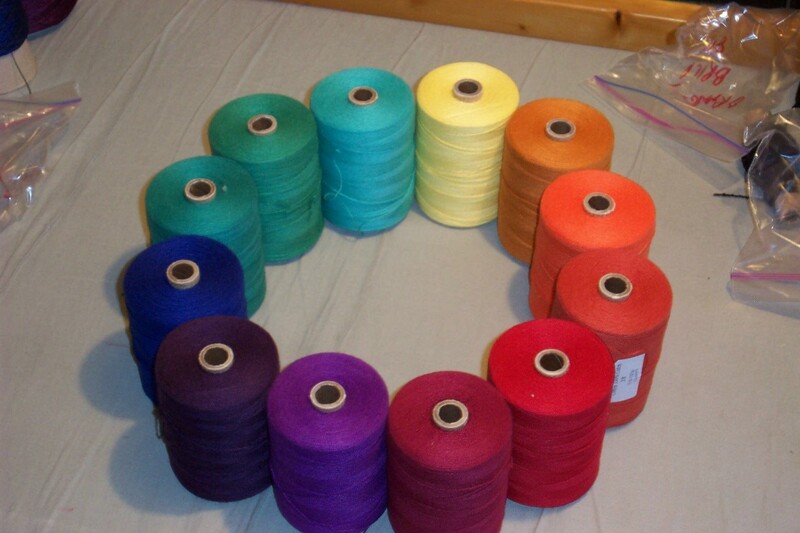 As such, the wefts are 20 of the 'rainbow' spectrum, plus 10 shades/tints/neutrals. A total of 30 different wefts, some of them very very close in hue and value. I'm not weaving just one gamp, which I could just go ahead and set the colours out, weave them off and never think about them again. No, I'm weaving three gamps. One in plain weave, one in 2:2 twill and one in 1:3 twill. 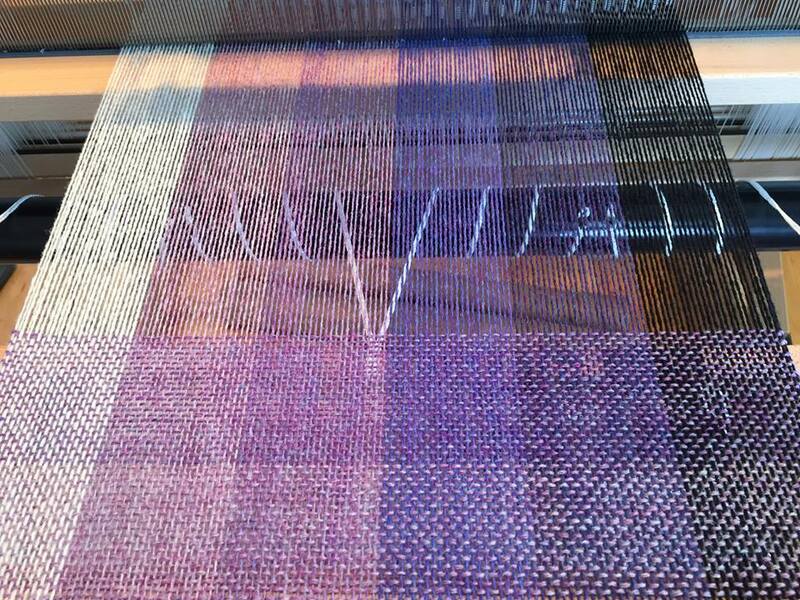 Not to mention there will be a gap of about four weeks between doing the first (plain weave) and the other two. I had to come up with a way to keep track of the colours in their order. At first I just laid them out in their order in the plastic tub, but there are multiple packages of each colour and at times it was very difficult to tell the packages laying next to each other apart. So I grabbed a box of little baggies, numbered them from 1-20 (for the spectrum - I'll deal with the last 10 later) and carefully laid them out in their order in the bin. Then I started winding the bobbins/quills (quills because I don't currently have 30 bobbins available!) and have laid them out in their order. At first I started by carrying five at a time over to the loom but I was still having too much trouble distinguishing the colours, so now I weave one colour (5" or so) get up from the loom, walk over to the work table, put the used quill/bobbin into the appropriate baggie and take the next back to the loom. It isn't the most efficient, in that I'm doing a lot of walking, but it is being very efficient in terms of keeping track of which ones I've done. And Fitbit is loving the 'extra' steps! Win-win! One of the things that one hopefully learns as they begin to master this craft is how things are likely to change when what you are doing changes. I know I've posted about this before, but that was after I did it 'wrong'. This time, I'm hoping I will have done it 'right', right from the start. My usual warp on the Fanny is about 11 meters or approximately 12 yards. The warp that went onto the loom today is not only longer at 16.5 yards, it is also slippery - mercerized cotton. A couple of years ago I had a large warping reel and I started winding longer warps - about 14 meters or about 16 yards long. The very first of the longer warps I started weaving I began noticing weird tension issues happening. There were areas of inconsistent tension. The brake wasn't slipping - there were actual patches or groups of warp ends that would get slightly looser, even out as weaving commenced, then a group elsewhere would exhibit loose tension. It occurred to me that these longer warps required higher tension during beaming. So I increased the amount of water in my water jugs and beamed using higher tension, and...voila!...everything was just fine again. So, with this warp of slippery cotton at 16.5 yards, I added four cups of water to each of my weights and got Doug to help me beam the warp. I could have done it myself except my back and neck aren't very happy with me right now, and having someone else add the warp packing and crank on while I groomed the warp chains made the whole job go a lot more quickly and easily. This isn't my warp, there is none to waste, and I want to do a good job because these samples are for another weaver to use in her teaching, not mine to do over or make a big mistake on! I'm just hoping that 4 cups of water was enough. I’m aiming for a Masters.....not in golf or after getting my Baccalaureate....no, I’m working on the Master Weavers Certificate Program. The program comes from Olds College in Alberta but I’m able to get instruction at the Gaelic College (GC). Last June, eight otherwise experienced weavers took the leap into the 5 year program being held in Cape Breton for the first time. We lived for one week at the GC with our instructor, Laura Fry. Most of us had experience with Laura as an instructor before - her tour de force called Magic in the Water and a workshop about Lace Weaves - so her style of practical tips and in depth instructing was not new but, as always, welcome. I am a teacher myself. 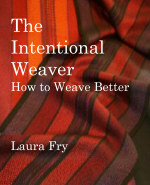 I am the weaving instructor at the GC where the busy summer classes demand an efficiency of style not unlike Laura’s. I’ve incorporated several of her techniques in my practice (using a weaving trapeze/valet, using my hand as a ‘claw’ to thread and sley). The Master Weavers program would, I assumed, test my proficiency to a new level. It didn’t fail. The week at the GC was jam packed with weaving exercises, lecture time, practice communicating with others, weaving samples, group discussions, weaving colour value samples and, of course, wet finishing. The group got to know each other better. Five of us came from the island of Cape Breton, one from the Annapolis Valley on the “mainland” of NS, one from the west side of Newfoundland and one from southern Ontario. We were all experienced weavers but it wasn’t crucial to take the course. Indeed, the way the course is set up, a nearly new weaver would gain yards of practical knowledge. You need to know a loom, you need to have dressed looms in the past, you need to be able to work within a time constraint getting those samples done. It was fun, a bit challenging, while reinforcing skills. At the end of the week, we went home a bit weary, inspired, focused and ready to take on the homework. Homework! For the next while, the “homework” was frequently on my mind while I did my usual....teaching at the college, preparing for my guild’s fibre festival, attending a workshop on tapestry, selling at market, preparing for Christmas and then finally.....the time slot was there for the homework. The homework is laid out in a way that takes you step by step through the entire process of making one handwoven piece: tell us how you dress your loom, which of these authors books is good for what you are doing, show a study of colour and your skill at plotting to get what you want when you weave, take a yarn and weave it at several setts to see how it works, look at plain weave and straight twill and how they respond to different finishing techniques, make a scarf or shawl to show how well you have learned all these lessons. It’s trial and error, it’s stimulating, it’s frustrating, it’s running out of the one yarn you thought would do the job, it’s challenging, it means you have to communicate in writing what you do without thought after years of weaving, it means you have to stay focused....watch every weft shot, make it fit just like all the other weft shots, drive the family a bit off the rails while you natter on and on about tiny incidentals of your work, it makes you want to do the absolute best, it’s disheartening when the washing machine won’t open at 10 minutes, it’s exciting when the samples and records are all gathered together ready to send for marking....it’s even a bit fearful when the package goes into the mail - did I remember everything, did I do it well enough? And then you wait to hear - did I pass?? For now I am ready and waiting for next year...1 down and 4 to go.....I’m aiming for my Masters! It is not unusual for one or two people to drop out along the way. Things happen. Jobs change. Life circumstances change. Some people move. Others have health issues suddenly crop up. Some take a 'gap' year to work on what they learned in level one. The Cape Breton class was unusual in that there was such a very high level of experience and knowledge. As expected they pulled off getting it done, even if it was just under the wire for a couple. This year all of the original students in level one at CB are continuing one to level two, plus this morning I found out that there will be seven in level one. Dianne wants to continue to grow the program at the Gaelic College and we will be discussing that while I am out there. I am weaving a 'library' of samples right now and this section is alternating between 1:3 and 2:2 twill. Rather than spend a bunch of time on the floor changing the tie up, I opted instead to just use a direct tie up (essentially a 1:3 twill) and when a 2:2 twill is required, I just use two feet. Much more efficient than constantly changing the actual tie up and way less time spent on the floor doing it. I came home to a boat load of critical deadlines which took me several days to wrestle to completion. It was a stressful few days while I dealt with them, several times messing up because I was rushed, or not thinking clearly, trying to bushwhack my way through my must-be-done list. Lurking in the background was my check up at the cancer clinic today. Was I responding well enough to the lowest possible dose? Or not? If not, what then? I didn't know. Turns out I'm doing just fine in terms of keeping the cancer under control. I do still have adverse effects, although they have reduced somewhat in intensity. It would appear for the next few years, this is my new 'normal'. As such, I am now gearing up to keep plodding forward - with a reduced commitment - once the book and conference are done. Just another 7 or so months for the book - if I can keep to schedule on that. Just another 13 or so months for the conference. The wrap up will largely be in the hands of the treasurer so once the event is over with, my input will be minimal. I have just been approached to teach again at John C Campbell in Sept. '19. I've said yes. Not because they pay well, but because it is near friends and I can piggy back a trip to visit with them while I am in the area. 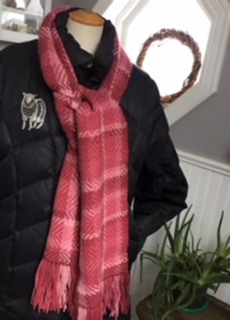 There is a school of thought about transferring yarn from one format to another - one that goes - never take yarn off the top of a cone or the end of a tube because you can add or subtract twist to the yarn. I've always hated taking yarn off the side of a tube (with one exception - sectional beaming with the tubes stood on end). Oh, I tried. I rigged up shoe boxes with knitting needles, had a spool rack where all the tubes were dutifully lined up, horizontally. And fought with excess yarn coming off the tubes, wrapping itself around the 'axle' the tube was rotating on as I tried to convert rotary motion to reciprocal and just finally decided that adding or subtracting twist really wasn't an issue with the yarns that I most commonly work with and have happily been winding warps on a warping board with my tubes stood on end for decades. Recently, curiosity drove me to figure out exactly how much twist was added or subtracted and came up with about one twist per 10" when the tube was full, gradually decreasing as the tube reduced in diameter until it was empty where it was one twist per 1.75 or so inches. Will this reduction or addition of twist affect your cloth? I really can't say. Each yarn is different and that degree of increase/decrease may - or may not - have any noticeable impact at all. And then there are end feed/delivery pirns. An end feed (or delivery) pirn means that the yarn comes off the tip of the pirn, adding or subtracting twist as it does. And the diameter of a pirn is much less than a tube or cone, therefore adding/subtracting more twist than taking the yarn off a tube/cone. Off the end of a cone, or off the tip of a pirn is just a difference in degree. Bottom line? If you can't be perfect be consistent. Choose a direction to remove the yarn from your yarn package, weave some samples, analyse them to see if the change in twist is affecting your cloth. And then do what pleases you. I wasn't pleased dealing with horizontally placed yarn packages, so I set them up vertically. YMMV. 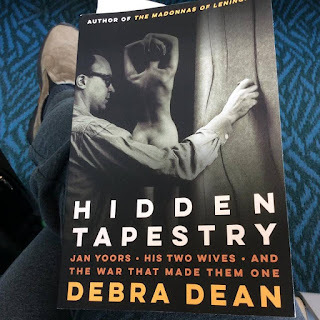 A couple of months ago the author, Debra Dean, contacted me to see if I would be willing to read her new book on Jan Yoors. I was happy to do so because I'm always looking for good books and one that deals with tapestry? Yes, please! It is not exactly what I expected but it turned out to be so much more. Ms Dean has thoroughly researched the lives of Jan, Annabert and Marianne. Any telling of their story would be incomplete without how World War II shaped their respective lives. This book is a fascinating examination of how war impacts young people (all were children or, in Jan's case, a teenager when the war began) and how they managed to shape their lives as they became adults. It is also an intimate look at an alternate lifestyle, one that includes being an artist in the post war era. Of course my main interest is in the tapestry style that they utilized but also glimpses into the art world first in England, then the United States. There is also information on Jan's relationship with another emigre family in New York - the Paternaya brothers and how they worked to provide Jan with custom colours for his tapestries. The Paternayan line of yarns is still being used today. 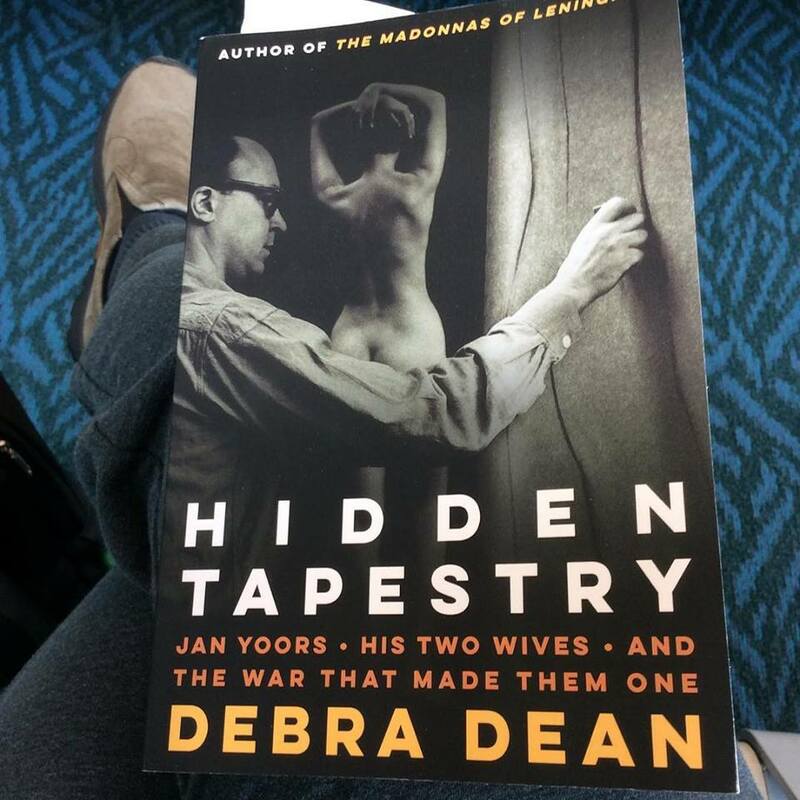 Debra Dean has clearly observed the lives of a trio of artists and shows great understanding - and compassion - in her depiction of these people. I use the living room floor as a staging area for my trips. While this is an old photo, my floor will soon look just like this again - or very similar. Some changes have been made. For one thing, the attache case that has traveled with me for literally thousands of miles over the years is just about ready to give up the ghost. So I have invested in a somewhat smaller backpack that I am hoping will see me through to the end of my travelling days. This last trip was the first time I used it and I need to sort out some things about what I pack in it, but I think it may just do the trick. The next three classes are pretty much back to back to back. 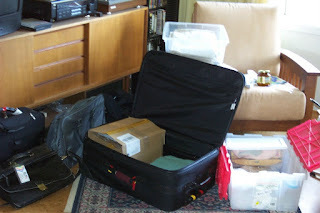 I will have to prep the last trip - the drive to Olds College, prior to leaving for Cape Breton. Or at least, as much as I can. Since level one unexpectedly filled to the point where the college agreed to run it, I now have to scoop the class materials I'd brought in for Olds for Cape Breton, and order more yarn in to cover the full (12 students) class in Olds. I will pull that order together later today and get it to Brassard tonight so they can get it into the mail to me. The skeins have to be wound onto cones for the Olds students to wind their 2nd warp - plus I have to wind the first warps for Cape Breton and Olds. Not something I can leave to the last minute. I had many hours in airports yesterday - way more hours in airports than airplanes, in fact - so I had some time to think. 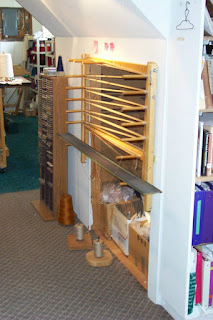 It was something I have known subliminally for a while - that being an itinerant weaving teacher takes just as much forethought, problem solving, organization of details and dealing with administrivia as does weaving itself. 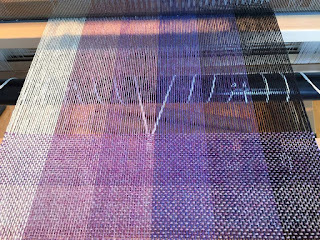 I realized that learning how to plan, schedule and meet deadlines is as much a part of mastering weaving as the weaving itself, if you are going to teach weaving as well as weave. In school one of my teachers looked at the way I organized my time and work and found my approach sadly lacking. I think of her sometimes, and her comment on one of my report cards that if only I would be more organized I would have gotten a better mark. And I wonder if she would look at how I organize my studio - and life - and be appalled at how I do what I do. OTOH, I feel that I have succeeded in most (not all!) of my life. I've just done it in a way that she might not recognize as any kind of organization. But we each process information differently, and perhaps her comment was more a reflection of the differences in how we process information? I have also had at least one student remark on an evaluation form that it was upsetting to her that I didn't go through the class manual in a linear fashion, but jumped all over the place. She found this confusing. But that is partly how weaving works - on the surface it seems as though the craft should be rigidly linear. But it isn't. Or at least, not in my mind! The main part of linear thinking in weaving is in the process of dressing the loom. But the designing of the cloth, well, that is far from linear. It is a constant sliding up and down the scale of opposites...drape->firmness, porosity->density, smooth->coarse...and so on and so forth. So my mind tends to hop from here to there and back again, constantly comparing, contrasting, tweaking. But today I am tired. It's a good tired because I saw such progress in all of the students. But because I'm tired, I won't do much in the studio other than some organization - the afore mentioned yarn order. And an inventory of the class materials to see if I need to replenish anything else (like the Harrisville threading/sleying hooks). I have 2.5 weeks until I leave, other studio commitments separate from teaching, plus getting ready to charge forward with the three classes still to be done. The usual chaos reigns as people come to grips with the program. The master weaving program is not your standard workshop. Workshops are geared toward conveying a nugget of information, or two. Workshops tend to be more social, with time for the participants to chat. This course is not relaxed. There is a great deal to do and time is limited. Feeling overwhelmed is the normal state for the first three days. It is only once the majority of the lectures have been given and the in class exercises done, or nearly done, that the students can begin to put it all together. Level one is probably the most difficult, for the students. And for the instructors. The students may, or may not, know some of the theory being presented. The focus, for me, is to try to start filling in some if the cracks in their foundation of knowledge. There are multiple processes being used, so that becomes confusing when students see different ways to dress the loom, or, after my demo, they try my way. It all feels very confusing on day two. So I am sitting quietly, fortifying myself with a cup of tea, getting ready to spread more information via the proverbial fire hose.